I dare you to name a Disney World food creation that has garnered more attention than the Dole Whip. The Dole Whip is a non-dairy, soft serve, frozen creation that has sparked numerous web postings and discussion board rants. I'm not sure if it is the wonderful taste and consistency of this frozen pineapple flavored treat, or the feeling that you truly are in Adventureland when you have one of these in your hands that makes this snack a must do for each Magic Kingdom visit for so many Dole Whip faithfuls. The Dole Whip is sold mainly at the Ahola Isle Refreshments stand near the Swiss Family Robinson Tree House in the Magic Kingdom's Adventureland. I understand that it may also be available in the Polynesian Resort. Primarily, the Dole Whip is served like soft serve ice cream in a bowl or cup, or a float (as pictured) when served with Pineapple Juice. Both of these concoctions are can be had for one Dining Plan Snack Credit (see Only WDWorld's Top Dining Plan Snack Values ). Although I thoroughly enjoy this tropical treasure, I am truly amazed by the buzz and attention that this snack garners. 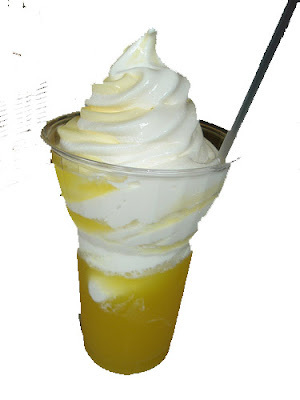 If you Google or search on Yahoo: "Dole Whip" you will get over thousands upon thousands of sites that may have information concerning the Principle Pineapple Treat for Walt Disney World. You can read about people who dedicated portions of their lives trying to duplicate the proper flavor and consistency of their vacation memory. They take their Dole Whips very seriously, and have spent a great deal of time, effort, and money in their pursuit of a quality homemade version of their favorite Disney treat. If you have never tried a Dole Whip, what are you waiting for? Make sure you put it on your list of things to do during your next Disney Trip. When visiting Adventureland in the Magic Kingdom look for the Aloha Isle Refreshments sign as pictured above. I do not necessarily buy into all of the hype, but I do agree that the Dole Whip is a mighty tasty and refreshing treat. For under $4.00 or a Snack credit, you too can experience what everyone is raving about! 1 comments to "Disney World's Culinary Icon - The Dole Whip"